Vinyl siding is the most popular siding choice in the United States, and it's no wonder why: vinyl siding's relatively inexpensive, energy-efficient, and low-maintenance. According to the Vinyl Siding Institute, vinyl siding carries a National Association of Home Builders' lifetime expectancy. So, whether you're remodeling your current home, or building a new one, installing vinyl siding is likely a one-time decision. Low-to-No Maintenance: You don't need to paint, stain, or caulk your vinyl siding. The only maintenance is periodic cleaning with soap and water. Energy-Efficiency: Insulated vinyl siding keeps your home warm in the winter and cool in the summer. This energy-efficiency may lead to lower energy bills for the life of your home. A survey by the Vinyl Siding Institute showed this to be true when insulated vinyl siding was compared to fiber cement siding. Noise-Dampening: Insulated vinyl siding keeps outdoor noises where they belong--outside. 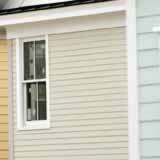 Vinyl Siding Cost: Vinyl siding installation is also often less expensive than installing other materials. The cost to install vinyl siding on a new home may be nearly ten times less expensive than stone, three times cheaper than wood siding, and nearly five times more affordable than brick. Vinyl siding can increase the value of your home, plus you can usually recoup vinyl siding costs up to about 80% when you sell. Vinyl siding cost savings and energy-efficiency benefits make it a smart investment for your home.